On June 30th, Bill Neville of Entrust came to share their 2018 market research report in which tracked real estate transactions through their clients’ IRA accounts. Traditional IRA’s were the most common type of IRA used to purchase real estate (75%). The most purchassed type of properties is single family residence (as 51%), followed by Multi-Family Residence (20%). Overall, purchases declined in the West by 4%. This may be an effect of a strong seller’s market, notably in California, where the majority of Entrust clients have invested in real estate. decreased 5% from 2016. This could be attributed to purchasers looking for more affordable properties outside one of the nation’s tightest property markets. The average price Californian clients purchased properties at was $260,242. Three of the four top states for real estate purchases in 2017 were also among the top for sales. California, Arizona, and Florida took the top spots in both lists. For Top Performing States Where Investors Sold Real Estate, California scored 48%. As with purchases, single-family and multi-family residences dominate the type of property sold, representing 64% of all real estate assets sold in 2017. Return on investment continued strong in the West as well, averaging 23% in California and 15% in Colorado. 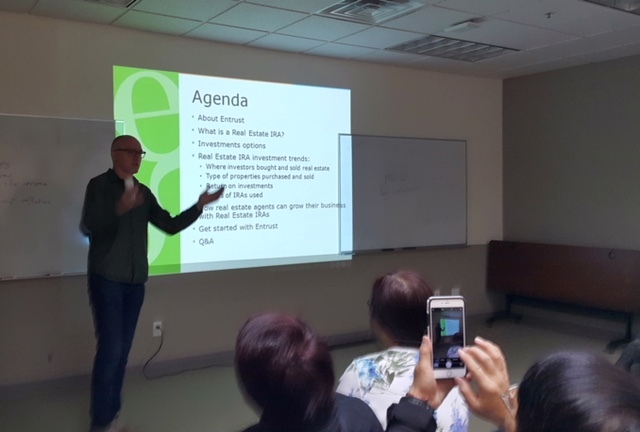 Bill closed the presentation with a run down of the steps of setting up an IRA account to make real estate purchases and highlighted the pertinent IRA rules and regulations.